Have you been dreaming about your dream property? In the current housing market, finding the right one can be a headache. But what are the alternatives? Perhaps you want a house where you can be part of the design process. With the rise of popularity of modular houses in recent years, this may be a viable option for you. There are many things you will need to consider, so we’ve compiled a useful guide to ensure you have all the information to decide what’s right for your new home. A modular home is a house which is built within a factory. Upon completion, this is then transported to the specified building location. Once these buildings are constructed in their new site, they are not designed to be disassembled or moved to a new location like mobile homes. The intention is solely to replace the previous building with the new prefabricated property. After the Second World War, modular houses were produced as a cheap, quick fit solution, however this perception has changed. Today’s versions are looking to give you a high-quality living space for your convenience. There are multiple benefits when deciding on modular homes. However, the economic reasons aren’t the only benefit of these structures. They are more energy efficient – These structures are more energy efficient than a standard home, due to their tight specifications. With optimum insulation, it can save you from expensive heating bills or you can use solar panels to conserve energy in the design process. They are relatively customizable – They can be customized to suit your own needs, which includes the interior and exterior of your property. Companies use state of the art Compute Aided Design software (CAD) and engineers to get everything to the right specification and look. However, it does come with its own limitations. The bills cost the same – Home loans, insurance premiums and taxes in fact cost the same as site-built houses. They’re quicker to install – These homes do not see delays in construction due to the manufacturing process occurring in-doors. A standard property can be built in 1-2 weeks, with another 2-4 weeks for the product to be in a livable condition. They’re a good investment – As with most property it’s likely the monetary value will increase over time, meaning that you should be able to sell the property for more than you paid for it originally, depending on market conditions. You will need to think about where you want your new home to be built, with Farmerstating “Modular will develop most where there’s cheap land, where the local authority is pragmatic and open to innovation, and where there’s a desire for quick delivery.”Once you have fully researched and decided on a location which is right for you, you’ll be ready to start your planning processes. What are the downsides to modular and offsite homes? After contemplating the benefits of modular homes, it is important to realize that they can end up being more expensive than originally thought depending on several factors. Here are a few things to consider before planning your new home. You’re only paying for the structure –Whilst the initial construction costs may seem cheaper, it is worth noting that you are only paying for the structure of the property. This means you will need to have electrical and plumbing services will need to be installed separately. You may also consider a basement, gas systems, or septic system for your new property. Travel costs –Another thing to think about is the cost of travel. If you do not live near the factory, the prices can rise to move the home from point A to B. Builders pay –The builder must be paid in advance in full, even before the construction has been completed, so you will need to have the money available before the process begins. Owning the land –To build your house, you must own the land where the property is located. Subdivisions –In contrast to on-site buildings, prefabricated properties cannot be built on subdivisions. Gaining approval –Whilst modular homes can be customized, they aren’t without their limitations. You will need to gain approval for your design, even down to their shape or look. As these buildings allow you to design aspects of your house, there are many materials you can choose for your interior and exterior of your new property. The choice in materials can have a lasting impact not only on the outward appearance of the building, but in terms of bills and energy efficiency, so it’s best to fully look up the options before committing. There are many materials available for your property’s interior; however, it may surprise you to know that modular homes predominantly use the same materials as traditional houses. Like the interior, materials used for modular homes are often the same as traditional homing construction. These houses can also be made of stone, brick or wood. These homes can be designed in any form, and so you could consider a wooden finish to give it a more natural look, or a contemporary finish. Modules are often transported without the finalized exterior finish, and so any cladding or finishing touches are installed on site, which promises a great look. Lightweight tiles have become one of the most popular materials in recent years. Steel provides strength and security against adverse weather conditions, vandalism and breakages. It has high durability, with a guaranteed 40-year life span if installed correctly. In comparison to more tradition materials like slate, clay and concrete, steel provides a modern aesthetic. This is a cost-effective solution, which will reward you in the long run. Excellent energy efficient and weatherproof, but costly to dismantle, especially when they are not designed to be dismantled. Therefore, the choice in materials can prove vital to consider in the initial stages of design. By choosing a material which can be easily dismantled, the home can be transported in a compact manner which can be cheaper. Before your modular home has been built, you will need to explore the factors involved in the transportation process of the building. Machinery during loading and arrival at location. With regards to load dimensions, you need to consider width as the most important specification. The height can be reduced by folding down aspects of the building, however if the structure is too wide, it may need specialist transportation permits, vehicle escorts and can be restricted to certain hours of travel. These factors could potentially increase cost and time regarding transit. The panels which form to make the walls, floor and roof are easily transported dependent on the specification. This ensures no damage to the property during the journey. When your structure reaches its destination, it will be lifted by crane and placed into the agreed position, where the final stages of the installation can begin. There are several maintenance tasks you should regularly perform on your modular home during the year. Here are several things to look out for through the months. This will allow your property to remain in optimum condition for a longer period. Removing ice buildup – As expected, ice can still build up on the roof of your home, which can cause significant damage to both the roof and exterior drainage facilities. Checking insulation – Ensure your premises allow effective insulation in your windows, doors or any areas of the house where heat may escape. Assess whether to use double or triple paned glass to windows with insulation tape. Check roof for missing tiles – Due to more adverse weather conditions during the winter months, traditional roof tiles can be prone to damage so it’s worth regularly inspecting the roof to ensure no tiles have been damaged. If spotted, this can prevent costly damage to your premises. Steel tiles like those supplied by Metrotile are far more resistant to damage than traditional tiles and are therefore much easier to maintain. Removing insulation tape – If during the winter you applied insulation tape to windows, remember to remove it once the temperature begins to rise. Checking air conditioner – Assuming the AC unit has not been in use since the previous year, you will need to ensure your air conditioner’s filters are clean and not obstructed. Removing debris from roof –With falling debris during the autumn months, leaves and other natural materials can fall into the roof of your home and cause buildups of water in the piping. Manually removing the debris will allow the constant flow of water through the exterior of the property. Check for leaks –This is important for any time of year but use your autumn to check for leakages which could cause lasting damage to your property. Modular homes are built to follow specific regional building codes and regulations, which are sometimes more rigid than traditional on-site homes. Building regulations relates to the standards concerning the design and installation of the property. These regulations are categorized into various parts with each letter representing a requirement. All modular and portable buildings must comply with these building regulations. New properties must fulfil conservation of fuel and power, which extends to re-furbished modular buildings or extensions of such buildings. With eco friendliness becoming a factor in the installation process, ensure you are compliant to the latest specifications. These regulations are subject to change depending on your location, so it is essential to make sure you are compliant to your regions. To finalise the building regulations you will need to get an approval to start work. You will have to pay a fee for application, and this will be regulated by the Building Regulations 2010. The time to get approval of the application can vary between 1-2 months, but this may be dependent on the local authority. It is advised that you wait for the approval before beginning the project. For more information about approvals visit GOV.UK. The next step will be to ask for planning permission for your property. This is necessary for any property where you will be building something new or making a major change to your building. You can apply for planning permission on the GOV.UKwebsite. Metrotile is a proud member of The Modular & Portable Building Association (MPBA) and demonstrates a continued commitment to the modular building industry. With an array of different colours, designs, and finishes available, our collection of lightweight steel roof tiles will add the perfect finish to any modular home. 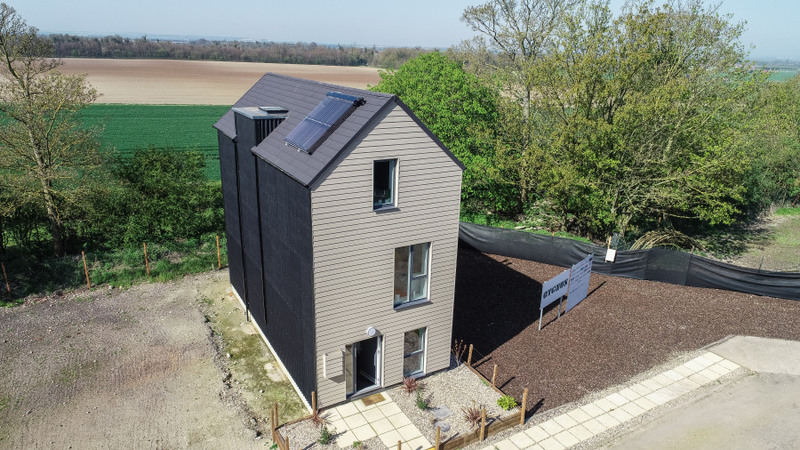 The low weight of Metrotile’s roof tiles make them ideal for all modular factory build projects demonstrated by the fact they’ve been installed on modular homes from fabricators such Cygnus and Ilke. If you’re considering building a modular home then find out how Metrotile’s’ high quality roof tiles can enhance your property. Request a free quotation onlineor simplycall us today on 01249 658 514.